Lindsey Graham delivers an incendiary speech in the video, egging on the Ukranian troops to re-start hostilities with Russia. Russia and Vladimir Putin derive no benefit from an armed conflict on Russia’s border, one which Russia is being blamed and punished for by Europe and the United States. And it was Moscow who forced the separatists to the table at Minsk, just when they had the upper hand on the battlefield following Kiev’s massive defeat in the Debaltsevo Pocket. Now, with the coming to power of Donald Trump as president of the United States, the putschists in Kiev have lost their principal sponsor. Trump has made clear his intention to prioritize relations with Russia – and European statesmen such as leading French presidential candidate François Fillon have begun to echo him. Germany is losing enthusiasm for this headache. 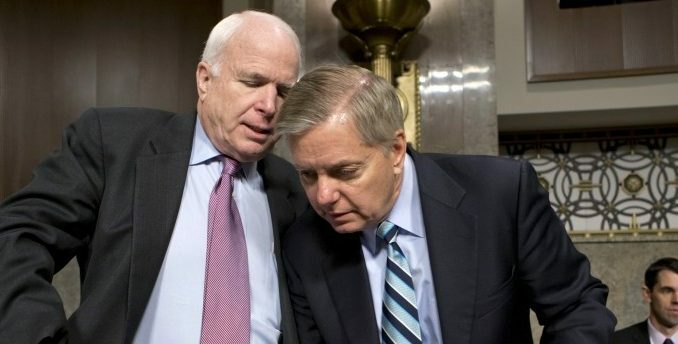 We do not know what else McCain and Graham promised Ukraine out of sight of the cameras. But lo and behold, within weeks of this trip, Kiev started a new round of shooting. The only possible motive for this outbreak of hostilities is a desperate attempt to regain the lagging sympathy of the world – a world long tired of Kiev’s crying wolf over “aggression” and looting billions of money intended to boost its economy. 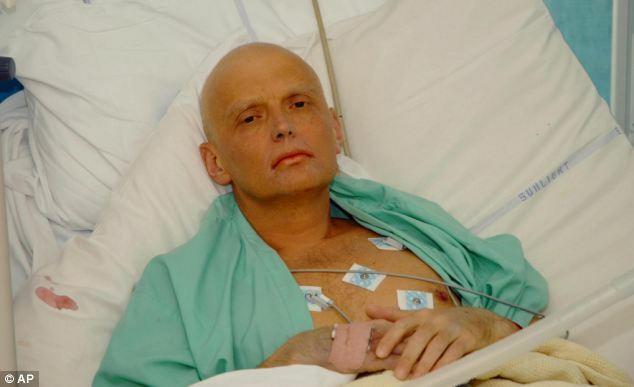 It is also another attempt to sabotage any US-Russian reconciliation. And just before Trump’s inauguration McCain confessed he had passed a defamatory “report” filled with salacious fake intel to the FBI, doubtless in hopes of wrecking his own president’s new foreign policy toward Russia. Donald J. Trump is now president of the United States. The president is head of state, and he directs foreign policy. Period. Yes the senate has the right to “advise and consent” on treaties and appointments, under the constitution. But the constitution does not grant congress the right to conduct an independent foreign policy. [T]he President alone has the power to speak or listen as a representative of the nation. He makes treaties with the advice and consent of the Senate; but he alone negotiates. Into the field of negotiation the Senate cannot intrude; and Congress itself is powerless to invade it. As Marshall said in his great argument of March 7, 1800, in the House of Representatives, ‘The President is the sole organ of the nation in its external relations, and its sole representative with foreign nations. John McCain and Lindsey Graham do not have the “authority of the United States” to represent the country abroad. They do not have the authority to promise weapons to Ukraine, or to suggest US support for a new offensive. That authority belongs exclusively to the president and his duly appointed officers within the executive branch. (In general, the secretary of state, ambassadors, and members of the foreign service.) There is no indication then-president Barack Obama granted them such authority. And President Donald Trump certainly will not. The Logan Act has often been discussed in cases of politicians abroad appearing to interfere in the president’s foreign policy positions. That said, though the law has been on the books since 1799, there has only ever been one prosecution under the act, and it failed. There has been a power change in Washington. Senators McCain and Graham, and all of their allies in the congress and on K Street, better get with the program. Globalism is finished. Neoconservatism is yesterday’s news. Trump and his advisors still believe in American power. But they realize some degree of cooperation with other great powers – principally Russia – is going to be necessary.